Now, if you seen me on local access, you've seen me talk about the need for full disclosure when it comes to people endorsing candidates. Take that into consideration when you read this letter to the editor from Robert Melillo in which he endorses Republican 1st ward Common Council member Shay Nagersheth. This year on Nov. 3 in addition to selecting who is going to serve the great city of Danbury as mayor I also have the opportunity to decide who is going to represent me on the Common Council. As a resident of the First Ward I will have an easy decision as to who should be elected when I go to Danbury High School and cast my ballot. The choice is between an individual who is already working hard as my current councilman or someone who has never held an elected office in Danbury. My choice is the obvious one, Shay Nagersheth. Shay has been working diligently over the last few years both as a ward representative as well as a city-wide representative on the Common Council. He has dedicated himself to the needs of his constituents. He fought hard to improve a drainage issue on King Street, has advocated for child safety zones, worked to keep Danbury services available, all while striving to control taxes and keep Danbury an affordable place to live. He has not only proved himself on the council but also has worked diligently trying to balance out the needs of the city while protecting environmental concerns as chairman as the Environmental Impact Committee. It is for this reason that I ask you to join with me in voting for Shay Nagarsheth as well as his running mate, Phil Colla as First Ward Councilmen. Now, notwithstanding the fact that in the last two years, I can't think of one time in which Nagarsheth has led a ad-hoc committee and/or asked ONE question during a Common Council meeting (and I have videos of almost all of the Common Council meeting since April 2006), the real problem I have with this letter has nothing to do with the endorsement, but the lack of disclosure from the News-Times when it comes to the person who gave the endorsement. POINT 1: Robert Melillo is an active member of the Danbury Republican Town Committee (as well as a member of the Zoning Commission, but that's really not relevant to this post). POINT 2: As a member of the DRTC, Melillo would had voted in favor of Nagersheth during the committee's convention earlier this year. Based on those two factors, the News-Times has a responsibility to alert their readers whenever a member of the Democratic or Republican Town Committee writes a letter in which they endorse a candidate. UPDATE: A reader email me and ask how Melillo was able to publish a letter to the editor endorsing a candidate when he's a candidate for the Zoning Commission. I'll try to find out if elected officials running for office can endorse another candidate on the same political ticket in a letter to the editor. At the very least, I would expect that the News-Times would write a disclaimer or not allow these types of letters to be published. I'll find out the newspaper's policy in terms of letters like this and keep you posted. Melillo is also the treasurer of current City Clerk's campaign. UPDATE 3: If a volunteer of Gary Goncalves campaign's letter to the editor had a disclosure statement attached to it, then clearly the News-Times has an obligation to disclose that fact the author of this letter is a member of the Republican Town Committee who voted in favor of this Common Council member's nomination as well as the treasurer of the current City Clerk's campaign. Please call or email the newspaper and inform them about this disclosure problem and request them to make a correction (be nice). UPDATE 5: You guys are killing me! According the documents which are easily available on the City of Danbury's website, Robert Melillo lives on 1 Lois Street. Lois Street is located in the 1st Ward by Golden Hill Road and Danbury High School. This letter clearly states that the writer lives in the first ward and is signed Robert Melillo. So much happened today in the court case against former mayoral candidate / anti-immigrant activist John McGowan that it's going to take me the night to re-read all my notes and do my write-up. Between McGowan's strange questions, Tom "Big(o)T" Bennett numerous disruptions in the court room, bizarre statements regarding jurisdiction, and dealing with a hearing which lasted hours instead of minutes, to say that today's court proceedings were interesting would be an understatement. Since this is day four of Elise Marciano BFF's trial (and I didn't talk about what happened on day three). I'll work on what happened on both days and post my write-up tomorrow. ...trust me folks, you don't want to miss what I have to say about what happened today! As the latest round of campaign finance reports come in, the Democratic candidate for First Selectman of Bethel has raked in more cash then his two opponents combined. What might be worrisome for the Republicans is the fact that the person they didn't nominee for their ticket out raised the person they chose to lead their ticket. The News-Times has the details. Democratic first selectman candidate Matt Knickerbocker came out ahead of his two opponents in fundraising for the Nov. 3 campaign, based on the most recent tallies. Knickerbocker has raised $14,690 for his campaign, with the majority raised in the last month. That is more than both his opponents combined. Incumbent First Selectman Robert Burke raised $4,550 this period, which added to his existing funds gives him an aggregate of $8,350 raised for his third campaign. Republican challenger Larry Craybas reported $2,075 contributions this month, with an aggregate of $4,250 raised for his campaign. Well get a better understanding on where the candidates stand once their last report is filed (10 days before the election). "It's already late in the (election) cycle and we do have a full schedule of events," he said. 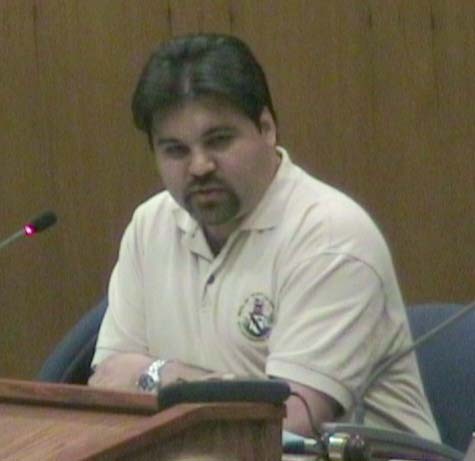 "I also have a responsibility to run the city of Danbury." Think I'm kidding, just read this letter to the editor. 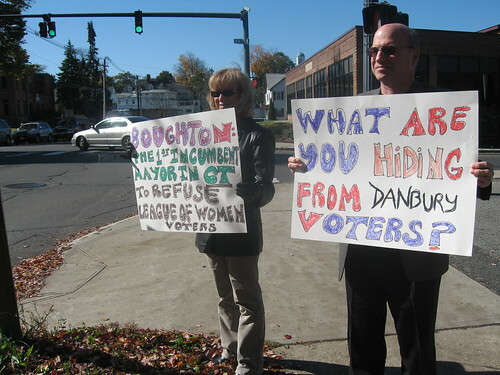 In the Oct. 20 article "Residents hold protest in front of City Hall," reporter Dirk Perrefort states "Boughton is the only incumbent in the state to reject a League debate in the last 15 years, a claim league officials couldn't verify." Verification came in the form of my conversation last week with Jean Rabinow of the Connecticut League of Women Voters. Sept. 10 was the date that Mayor Boughton was invited by the League to debate. He said he never received it, so a second invitation was sent on Sept. 24. In the article, the mayor excuses himself from debating by referring to the lateness of the follow-up invitation. 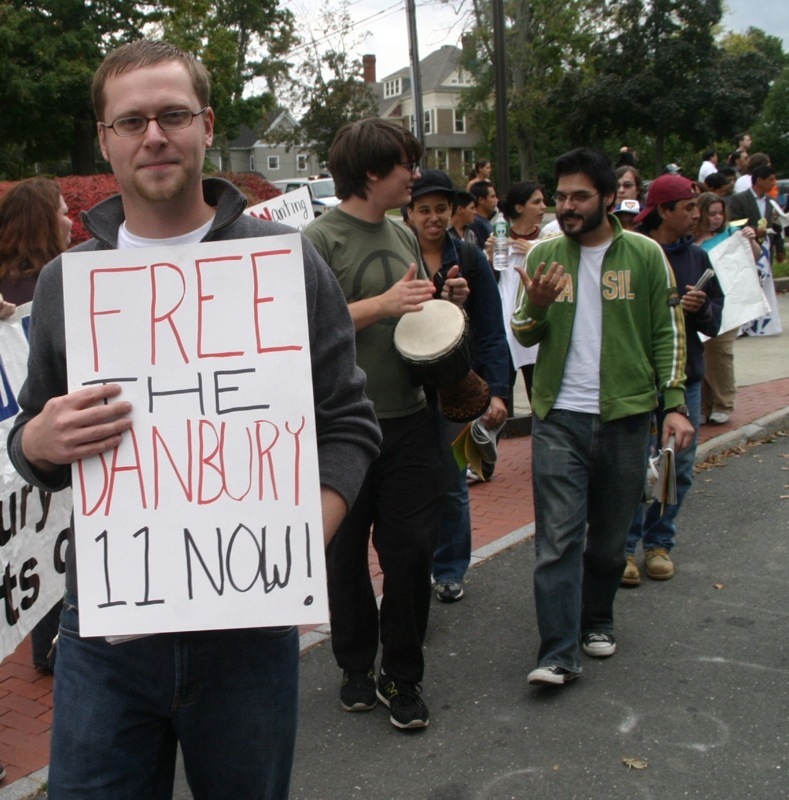 Past excuses from the mayor include: his first responsibility is to run the City of Danbury. I respect that comment, only on the proposed evenings of the debate, Oct. 20 and 22, he was scheduled to enjoying dinners at Barden Corporation and Ability Beyond Disability. Not to diminish their importance, I still think his first allegiance should be to the larger voter population. 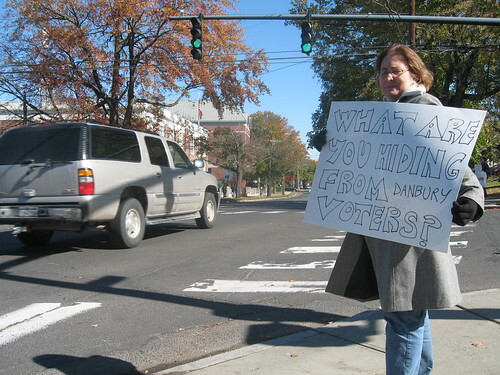 This action shows great disrespect to the League, the voters of Danbury, and his Democratic challenger Gary Goncalves. The League is about education in a nonpartisan, accessible and open forum with a live audience and it's free. Not during a $45 per plate luncheon, not on cable -- and not in a Republican-oriented venue. So Boughton couldn't provide the public a FREE and OPEN debate because he couldn't break his dinner appointments?!? People over Politics or Politics over THE PEOPLE! Today in a letter to the editor to the NewsTimes, one of my opponents volunteers alleges that I was attending two dinners (one for Barden, and one for Ability Beyond Disability) on the nights for potential League of Women Voter debates. Aside from dragging two terrific institutions into politics, one a major employer (Barden) in Danbury, and the other an outstanding service organization that does tremendous work with the disabled (Ability Beyond Disability), the author of the letter is just...wrong. Tuesday evening I attended an employee recognition night for Barden Corporation (congratulations everybody) two awards (one posthumously) were given by me for 50 years of service to Barden. I did not stay for the dinner. This event was booked long before any campaign events except the Chamber of Commerce debate which was scheduled at the beginning of the fall. Thursday evening I am scheduled to attend an auction at WCSU to feed people less fortunate than us and then I am playing in a wheel chair basketball game for Ability Beyond Disability at Danbury High School. Stop by and check it out, it is a major fundraiser for the organization.. No dinner in sight. let's go back and re-read the mayor's excuse in not agreeing to a FREE and OPEN debate. So, your responsibilities to the city of Danbury consist of attending an awards ceremony (hmm...wonder how long that took you to do) and a wheelchair basketball charity event. These two things prevented him from doing at least one FREE and OPEN debate for the residents you supposedly care about? 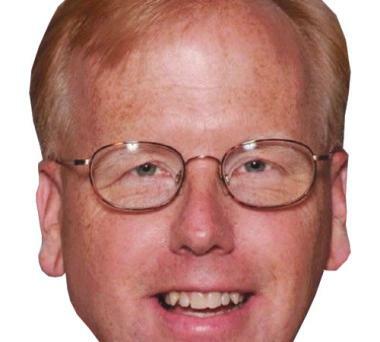 Mayor Boughton had events to do on Tues and Thurs? Okay, fine. How about Monday, Wednesday, Friday, the weekend? I'm sure many members of the public would like to see your schedule for every evening from now until election day (including weekends) so we can ALL see how busy you really are when it comes to running the city. 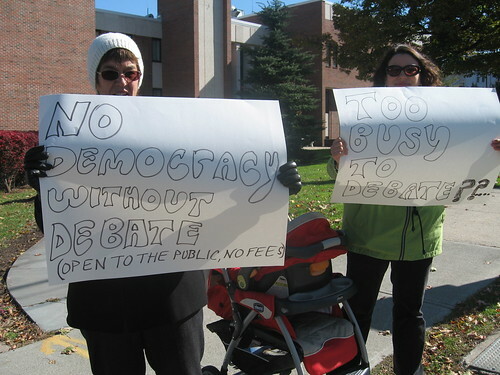 I mean since your so busy from now until election day to do ONE FREE and OPEN debate, I think the public has a right to know exactly what you're doing (besides littering the area with MORE lawn signs). In short, the mayor of the 7th largest city in Connecticut felt that attending two fundraisers is more important than offering ONE FREE and OPEN debate...and he has the audacity to describe the person who informed the public about his schedule as "pathetic." In honor of the swarm of ladybugs which have infested Danbury, here's an article from the NY Newsday that sheds a little light on what's happening. ...for the position of Common Council (at large) that is. The Danbury Area LWV will sponsor a debate for Common Council candidates running for the seven at-large positions on Danbury ’s Common Council. The debate will take place on Tuesday, October 27th at 7:00 pm at the Ives Concert Hall on the midtown campus of Western Connecticut State University. The debate is open to the public and all fourteen candidates have been invited to participate. Danbury ’s 21 member Common Council is made up of two Council members elected from each of the city’s seven wards plus seven Council members elected at large to represent all city residents, regardless of the ward they live in. “This combination of having some local representatives to address neighborhood issues, and some at large representatives, to address more universal issues, gives our legislative body the chance to really reflect the diversity in our community,” stated Elder. “Many Danbury residents don’t realize that the at large Council Members on the Common Council represent them as well, “she concluded. This debate will give voters an opportunity to hear these candidates respond to six predetermined questions and make a closing statement. 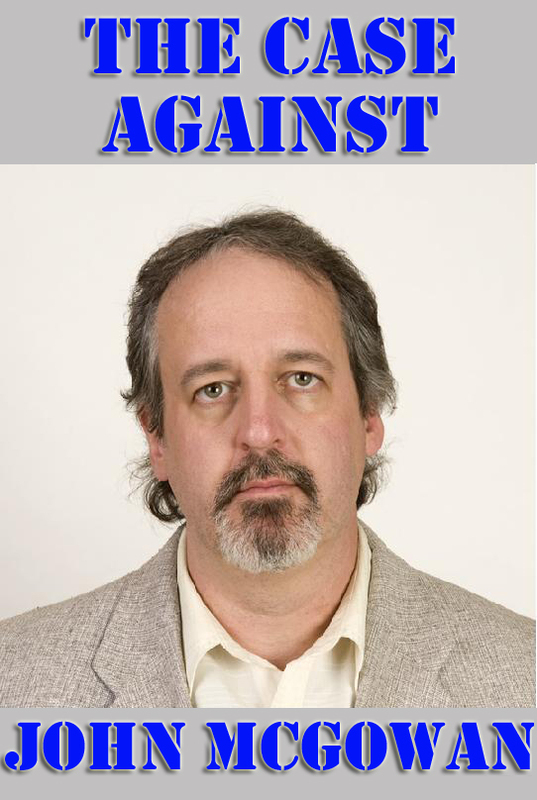 The debate will also be taped by John Neumuller for Danbury Live and broadcast on Comcast Channel 23. This is the first time in my memory that I can remember the candidates for Common Council (at-Large) agreeing to a debate...in fact, this is a GREAT idea that ALL candidates for the Common Council should take note of in the future. This afternoon, a group of residents held a protest outside City Hall to express their outrage over Mayor Boughton's arrogant refusal to hold FREE and OPEN debates with Democratic mayoral nominee Gary Goncalves. 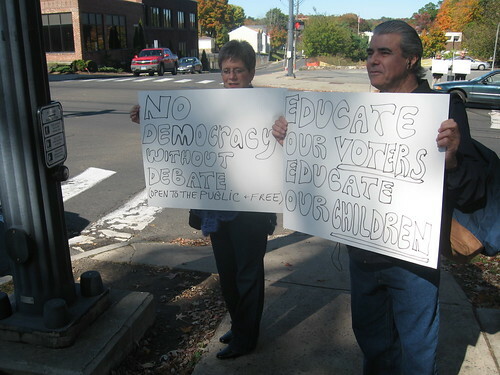 Led by organizer Ellen DuBois, protesters armed with signs such as "No debate in a police state", "No Democracy without debate" and "What are you hiding from Danbury voters?" walked along Deer Hill Ave and West Street and made their presence known during the hour-long protest. Before things got underway, I had a chance to interview DuBois about the protest.